For this live text and maybe for Jose Mourinho too. Another defeat for champions Chelsea, while at the other end, Leicester move level on points with leaders Manchester City. Is the Premier League table upside down? Join me tomorrow for more top-flight action, Until then. Chelsea goalkeeper Asmir Begovic: "We definitely did enough to get a result here but when things aren't going your way you don't get the luck you deserve. "We hit the post, we slipped over when we had open goals, we are making things hard for ourselves. "You can see from the game today it [our problems] is not something you can pinpoint. We are getting punished for little bits and pieces but eventually it will turn. "Jose Mourinho did the pre-match talk at the hotel and that was it. [Are you concerned that there may be a change from above?] "That is out of our hands, we are behind the manager you can see that from our performances. We think he is the right man and someone we work hard for. Chelsea goalkeeper Asmir Begovic claims Jose Mourinho's "presence is all around us" in the post-match interview. Maybe that is the problem for Chelsea at the moment. More from Stoke boss Mark Hughes on BBC Sport: "We displayed great character today, all the qualities you need to compete against one of the best teams in Europe. They have world class players. "We are really delighted. We have beaten them twice in a short period of time and both efforts were outstanding. "Chelsea played well today, they weren't poor. They are struggling to get positive results but they will turn it around, no shadow of a doubt. Maybe they won't go up against sides as committed as we are every week. "Erik Pieters stood up to be counted. It was a really bad bang, both nostrils were bleeding badly and his breathing was affected. All credit to him. "Ryan Shawcross loves those challenges, You have to have physicality in the Premier League and you have to match strikers like Diego Costa. Ryan showed his qualities, he continues to be overlooked at international level but I haven't seen many players who understand the role like he does." Jon Cooper: Chelsea dominated for the most part. One world-class goal, great keeping and more bad luck won that for Stoke. Rob Savage: How can we play so well and still lose? We were all over Stoke, we should have had a penalty and a red card for the foul on Remy, and the effort was faultless. Keep fighting, Chelsea - we will overcome this blip. Stoke City boss Mark Hughes on Match of the Day: "We are all been in that situation, you just have to keep winning so the focus goes elsewhere. "I have had similar situations and sometimes you go under. Jose Mourinho has enormous credit at Chelsea, he has delivered trophies and surely people should cut him a little bit of slack. "I see no reason why they should make a change but there is always focus in the Premier League." Stoke manager Mark Hughes says his side "deserved the luck of the game". He's chuffed and why would you not be. Kevin in Ireland: Jose surely skating on thin ice tonight. Does anybody think Chelsea might be this season's Borussia Dortmund and struggle all season domestically? Stoke captain Ryan Shawcross on Sky Sports: "Diego Costa gets in your face, he wants to bully you so you have to stand up to him. He is a fantastic player who plays close to the line, so to keep him quiet is fantastic. "We have a fantastic spirit and a good team now. Look how many Champions League winners' medals we've got in the squad now." It's the first time since October 1999 that Chelsea have lost three league games in a row. That was at a time under the halcyon days of Gianluca Vialli. Chelsea have now lost seven games in the league this season. Only the bottom three of Bournemouth, Sunderland and Aston Villa have lost more. It's relegation form from the Premier League champions. "Stoke defended tremendously well and had some good pieces of play. It's been a great night of entertainment, with the fans on the edge of their seats for all 90 minutes. "Stoke really deserve the win after such a battle. All over the pitch, each player deserves a pat on the back. They deserve all three points." Captain John Terry walks over to the Chelsea fans. He applauds them and pats the badge on his chest before giving a thumbs up. Keep the faith? Meanwhile, Stoke pick up a well-deserved three points and move up to 12th in the league. All over at the Britannia Stadium. All over for Jose Mourinho? Chelsea decide to play a short corner and Willian finds space on the right. He shoots goalwards, but the warrior Erik Pieters is in the way of it. Marko Arnautovic is played through on goal, he reaches the edge of the area, but is dispossessed by John Terry. ...but Oscar's shot is straight down the throat of Jack Butland. "The Stoke supporters are even cheering throw-ins!" Ball into the Stoke box, cleared. Four minutes added on. Last minute. Can Chelsea nick a point? Chelsea fans look on glumly. They feel it's not going to happen for them. How much more of this can owner Roman Abramovich take? It has not quite happened for Eden Hazard so far tonight, but it is not because of any lack of effort from the Chelsea forward. The Belgian has wandered across the pitch trying to get on the ball in areas that will hurt Stoke - his Blues team-mate Willian (81) is the only player on the pitch to have had more touches than Hazard's 66 - but none of his four shots have found the target. Loic Remy is played in by Diego Costa. He goes round Jack Butland but can't keep his balance and gets a weak shot on goal. Could it have been a penalty? The Stoke goalkeeper did get a slight nick on the striker, but to his credit, he played on. There was the chance for Stoke to end the game. Great work from Ibrahim Afellay to win back the ball deep in the Chelsea half. They play quick passes and the ball eventually reaches Jon Walters at the right side of the area, but the Republic of Ireland man's shot is shanked into the stands. "Everbody is getting a little bit tense here. Stoke are sitting back too much and they have no release. Subs being brought on will add fresh impetus to their efforts. Xherdan Shaqiri, who's just come off, has had a great night." Chelsea have not played badly at all here apart from that end product - but time is running out here at The Britannia Stadium. They have either not found the final pass or their luck has been out, as it was when Pedro struck an upright. Chelsea need to find something soon here as Stoke's fans turn the volume levels up even further in an attempt to push their team over the line. If Chelsea are missing something at the moment as they chase this goal, it is width. More pace for Stoke. Striker Mame Biram Diouf on for the impressive Xherdan Shaqiri. Chelsea captain John Terry is now playing as a striker. His back heel finds Cesc Fabregas, who plays the ball on to Eden Hazard. Hazard for the bottom corner??? NO! It takes a nick and trickles wide of goal. The free-kick from Willian is poor, not what you expect from the Chelsea man. It failed to clear the first man. Into the last 10 minutes of the match, the last 10 minutes of Jose Mourinho as Chelsea boss? Stoke bring on the sprightly Ibrahim Afellay for Charlie Adam. He'll cause from problems on the counter. Midfielder Ramires off, striker Loic Remy on. Last throw of the dice for Chelsea. Last chance to save Jose Mourinho's Blues career? Chelsea probing for a way through but are getting frustrated. Nemanja Matic lashes a shot over and Stoke will be happy with that. Erik Pieters again takes one, this time from Diego Costa. The Stoke man will need a bucket full of plasters for his knocks tonight. Baba Rahman's agonising evening is over, he's been put out of his misery. On comes Cesc Fabregas for Chelsea. Pedro is also off and Oscar replaces him. For Stoke, defender Geoff Cameron comes on for frontman Bojan. Chelsea's Eden Hazard tries to wriggle clear but there are eight red and white Stoke shirts in front of him. He'll need to conjure up some master sorcery to get through that. David Copperfield-esque. End to end stuff at the Britannia Stadium. Willian plays the ball across the edge of the Stoke box to Pedro, who opens his body up and curls an effort against the post. "The poor left-back Baba Rahman doesn't know what to do whenever Xherdan Shaqiri gets the ball. He's looked very, very good tonight." Xherdan Shaqiri has really given Chelsea full-back Baba Rahman a torrid evening, the Ghanaian can't get anywhere near him. He's getting tangled inside out like spaghetti. A few lollipops from the Swiss international before chipping the ball into the box, but Marko Arnautovic can't get his header on target. Stoke go to the other end and former Chelsea full-back Glen Johnson curls an effort off target. Jack in Devon: Chelsea not only need to start winning, but start playing the style of football that we were all in awe of last season. There are a lot of things that need to change, but I don't think the manager is one. Marlo from London: How can Jose sneak into the Britannia? Put on the Chelsea number 10 shirt - it makes the wearer invisible! What can Chelsea do now? They've already lost six games in the Premier League this season. Surely the title has been relinquished even at this early juncture. Stoke holding firm so far. The Blues have a huge red and white wall to knock down. Eden Hazard looking to change the game for Chelsea. The Belgian weaves in and out and fires a shot over the bar. This graphic does not really do justice to the quality of Stoke's goal but it does at least show you how they spread play across the pitch before getting the ball into the danger zone and finding the finish. Those stereotypes of Stoke's so-called direct approach look lazier every game they play a game under Mark Hughes' tenure - this Potters team like to get the ball down and play. Stoke City have played with real purpose after the break and this atmospheric arena is now a cauldron of noise after Marko Arnautovic's goal. Ryan Shawcross is booked for flattening Diego Costa. He needs to keep his composure because Chelsea's striker will be looking to draw him even further into a battle now. The same applies to Arnautovic - Stoke will need all hands on deck here. This one is going to boil over. Goalscorer Marko Arnautovic loses the ball and barges into the back of Willian. Handbags follows between the two sets of players. Just a little pushing and shoving, no-one's going to throw any punches. Ryan Shawcross with an arm into the face of Diego Costa, and the Stoke captain is given a yellow card. Could have been worse. Chelsea go on the attack and Nemanja Matic's left-footed thunderbolt is pushed away by Jack Butland. "Great play. Shakiri's involved again. I thought Jon Walters had missed the chance, it drops to Marko Arnautovic and it's a super finish.That's what Stoke needed. It was getting scrappy and niggly, now Stoke have a goal." Chelsea in trouble. From the resulting free-kick Stoke make them pay. Xherdan Shaqiri slides an inch-perfect pass through to Glen Johnson running into the box from right-back. His cross into the box is unable to be finished by Jon Walters, but Marko Arnautovic is in a perfect position to scissor-kick home an emphatic finish. Now Jose, what can you do...from the comfort of your hotel room? "Steve Holland has got plenty of experience. He's worked with Jose long enough to know what he thinks. And I'm sure Jose has had a way to get his thoughts across at half-time, by whatever means." The ball bounces up in the middle of that park and it's a 50-50 challenge. Nemanja Matic gets his head to it first, but Charlie Adam comes clattering in to the Serbian. No card, but could easily have been. Cesar Azpilicueta's cross-field pass towards Diego Costa is too long and the full-back turns away in disgust. So he should. Neither side has got going so far. The petroleum jelly has done the job for Erik Pieters, smothered all over his blue and red hooter and the Stoke full-back is fit to continue the match. Xherdan Shaqiri's cross is too close to Asmir Begovic who plucks it out of the sky with ease. Back under way at the Britannia Stadium. Which way is this game going to go? Last thing we need on a busy Saturday night is for Jose Mourinho to get the boot. The Stoke players are out on the pitch, but no sign of the Chelsea guys yet. Some sad news to report on. Former Chelsea manager Bobby Campbell has died aged 78. Campbell managed the Stamford Bridge club from 1988 to 1991, guiding them to promotion to the top flight in 1989, following their relegation to Division Two the previous season. He also managed Fulham and Portsmouth and had coaching stints at Arsenal, Aldershot and QPR, and in Kuwait. Born in Liverpool, his playing career took in spells with Liverpool, Portsmouth and Aldershot. Steve is on the wind-up me thinks - any biters? As he tucks into his hotel room service, Chelsea manager Jose Mourinho will be almost wholly satisfied with that first half - almost. Chelsea have been by far the better team but just cannot apply the finishing touch to some classy approach work. We must assume 0-0 at half-time was one of the "1,000 scenarios" Mourinho prepared his backroom staff for before the game so they will be relaying his message right now. Most of Chelsea's attacks have come down the right tonight, but that is not just down to Pedro, who as usual has done most of his work down that flank. Eden Hazard and Willian, the other two parts of the attacking trio in the Blues' 4-2-3-1 formation, have been roaming across to that side of the pitch too and, with Cesar Azpilicueta getting forward from right-back too, they have kept Stoke left-back Erik Pieters busy. "Great entertainment, I really enjoyed it. I thought Stoke started really well. Chelsea got back into it and at the end of the half we were on top. I think it's been a cracking game of football with a great atmosphere." Nowhere to hide in this one, it's been tough. Just look at Erik Pieters's face to see how much of a battle it has been. Still goalless though. That looks a painful one. Willian slips and bends his right leg. He's back up but limping. Xherdan Shaqiri has given Chelsea full-back Baba Rahman a difficult time today and the Ghanaian clips his opponent following a smart turn from the Stoke man. He goes in the referee's book for that one. Four minutes of injury time to play, after Pedro mangled Erik Pieters's face early in the match. 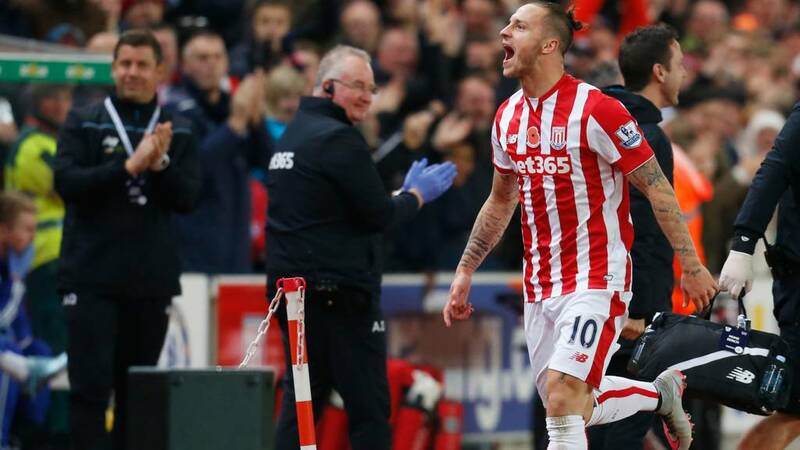 Stoke man Glenn Whelan is the first man in the booked for scything down Eden Hazard. Here is the evidence in graphical form of how much of this game has been fought out in midfield. Stoke are struggling to get forward while Chelsea, as seen with that Diego Costa chance just now, are doing slightly better. Chelsea starting to get a hold in the match, Striker Diego Costa exchanges passes with Pedro, makes his way into the box fires a low effort towards goal which is kept out by the legs of Jack Butland. The away side's best chance of the contest so far. As you would expect, a Stoke defender rises to clear the ball away. How can Jose sneak into the Britannia? It's not exactly a high quality contest, but one filled with bloodlust and thunder. A hard-fought mid-table Premier League clash. A tussle in the box, Ryan Shawcross in the red corner, John Terry in the blue. The Chelsea captain is not happy with the attention the Stoke man is giving him, but he can hardly complain. Referee Anthony Taylor steps in to separate the pair. Erik Pieters in the wars again. This time he cops one...somewhere painful. Wouldn't want to be him at full time, his nose looks a right mess. ...and work a quick one. Willian finds an unmarked Eden Hazard at the edge of the box, but his strike is blocked by a Stoke defender. You suspect this is the sort of game Chelsea manager Jose Mourinho will be enjoying in the comfort of his hotel room - lots of meaty challenges and all the ingredients that would have had him in discussion with the fourth official had he been allowed in. Stoke's fans - as ever - urging their team forward but Chelsea showing lots of promise in attack. Diego Costa almost crowned some magnificent work from Pedro and Eden Hazard but couldn't stretch enough. Rui Faria, as combative a figure as Mourinho on occasions, is now taking his turn in the technical area. "It's a super ball, you can't ask for a better delivery than that. You just need somebody to get on the end of it and Diego Costa couldn't." Xherdan Shaqiri is enjoying his evening, shimmying this way and that, moving that squat, little body of his as he gets the better of left-back Baba Rahman. His ball into the box is met by the head of Jon Walters, but the striker can't get it on target. Stoke are getting the ball in Chelsea's final third but can't find a good pass towards the front man. At the other end, Eden Hazard expertly controls the ball and whips in a delightful cross, but again, a Chelsea man can't grow enough to get his toe on it. This time Diego Costa was the unfortunate one. How could Jose sneak into the Britannia? Ooh! A sumptuous free-kick from Chelsea's Willian, in between the defenders and the goal, which Kurt Zouma can't quite get on the end of. Jack Butland sees it go wide. This is like WWE Royal Rumble, bodies everywhere. These two are really getting stuck into each other. Ramires with a 30-yard dipping shot which Jack Butland tips over the bar. Was dropping in but at a good height for the England man. Jon in Altrincham: Perhaps Jose could dress as a referee? No-one would expect that, surely. Will: Maybe Jose could disguise himself as a member of the Chelsea defence. No-one has spotted them all season! HAVE SOME OF THAT! Ryan Shawcross isn't taking any prisoners and comes through the back of Diego Costa, who saw him coming but decided to stand his ground. Crash! The big Chelsea front man is sent sprawling to the deck and the home fans love that. Great chance for the opener for Stoke. As we saw from his Liverpool days, Glen Johnson likes a run forward and he finds himself on the edge of the opposing penalty area. He turns and executes a low left-footed shot which is bound for the net, but Asmir Begovic pounces full length to keep the ball out. How can Jose sneak in to the Britannia? No quarter asked or given here. Chelsea striker Diego Costa has already incurred the wrath of Stoke City's fans after a clash with Ryan Shawcross while Erik Pieters is covered in blood from his nose after being caught by Pedro's boot. That one looked a complete accident altough Stoke's noisy support disagree, singing in the direction of referee Anthony Taylor: "If he played for Stoke you'd send him off." In Mourinho's absence coach Steve Holland seems to be giving the directions from the technical area. Erik Pieters is back on the pitch looking a little worse for wear. 7 November 2015, the day he lost his looks. Poor lad. The Blues come away in a flash, as Eden Hazard carries the ball forward and plays it into the in-form Willian at the edge of the area. You think the Brazilian would shoot, but instead lays it off to the incoming Ramires, who stabs an effort wide of goal. Erik Pieters started this match looking like Justin Timberlake, he'll leave the pitch looking like Steve Bruce. His nose is going left, right and then left again. The action continues without the full-back. The physio is still attending to Erik Pieters. Can he continue? Marc Wilson is sent out to warm up. Highlights from all 28 FA Cup first-round matches are winging their way into our system as we speak, and they will all end up on this page here. There are already a handful there for your enjoyment. Check it out! Erik Pieters is bloody-nosed after that accidental collision. Both him and Pedro had eyes on the ball. Pieters has a few tears in his eyes, it's a nasty one. Stoke left-back Erik Pieters in a lot of trouble here. He stoops to head the ball, but chances a Pedro foot square on his nose. He'll be feeling like he's caught a right hook from Lennox Lewis. We want your ingenious ways for Jose Mourinho to sneak into the Britannia Stadium. Get involved on Twitter using #bbcfootball, text in on 81111 or comment on the Match of the Day Facebook page. Stoke goalkeeper Jack Butland smiles at Diego Costa. That's just going to wind him up even more! The 'keeper doesn't deal with the corner too well with a weak punch, but his team-mates clear. No goals yet, but action packed. Jose Mourinho sneaking into the Britannia Stadium wearing a Jose Mourinho mask? That would not surprise me at all. Chelsea fans chant their manager's name. Neat work from Pedro inside the box, creating an opening for Eden Hazard who blazes over. Chelsea's fans (or at least we assume they are Chelsea fans and not the man himself) are hiding behind rather a lot of Jose Mourinho masks in the away section of Stoke City's Britannia Stadium. Jose? Spot of pre-match room service perhaps? A lightening start from the home side. Marko Arnautovic dispossesses Cesar Azpilicueta on the right and Chelsea fail to clear. The ball is eventually clipped towards Xherdan Shaqiri inside the area, whose spectacular scissor kick sails over. Stoke boss Mark Hughes hit a few of those in his time. We are a go at the Britannia. Chelsea playing from right to left. A minute's silence is held for those who have fallen in combat. A lone man plays the Last Post on the trumpet at the side of the pitch. The Britannia is bouncing, would you expect anything less? Stoke do a team huddle while the Chelsea players have a last word with each other. Stoke are in the tunnel, looking psyched up, but they are still waiting for Chelsea. Are they on FaceTime getting a team-talk from Jose? Chelsea's Champions League win over Dynamo Kiev on Wednesday was a massive result. Not just because of the victory, but because they got it after being pegged back to 1-1 late in the game. I think it could turn out to be a turning point in Chelsea's season, because it was a completely different reaction to the one we saw from their players when they conceded an equaliser just before half-time of their defeat by Liverpool last weekend. Stoke will be ready for them, but I am backing Chelsea to win this time. How things change in 12 months..
Lots of wisecracks about Jose Mourinho savouring the warmth of his room at Chelsea's hotel rather than the traditional freeze-in at Stoke. Let it be said that the weather is positively mild and the environment of The Britannia Stadium is one of the most enjoyable and atmospheric in the Premier League. But can they do it on a Saturday in Stoke? Oh yeh, Stoke are also in action today. In fact, they go into the game one place and two points better off than Chelsea. The Potters have been on and off this season. A slow start followed by three straight wins, but they've failed to score in their last two games. Big summer signing Xherdan Shaqiri needs to start firing. Can he do it on a cold, Saturday evening in Stoke? Is that you, Jose?Image caption: Is that you, Jose? Remember when Jose Mourinho got a Uefa ban and - allegedly - snuck in to the Chelsea dressing room in a laundry basket for a Champions League match against Bayern Munich? He might have to employ similar tactics today. If you were Mourinho, how would you sneak in to the Britannia Stadium without being noticed? Or tell us about the time when you sneaked in to an event when you shouldn't have done. Think you know your football? Have a go at predicting the outcome of this match and the rest of the weekend's fixtures by playing the BBC Sport Predictor game. "You [expletive] referees are weak... Wenger is right about you... you are [expletive] weak." Mourinho, J. (Oct 2015). Hardly Aristotle and those words were the start of a rant in the referee's dressing room at half-time against West Ham which led to a stadium ban for today's game. As he is not allowed inside the Britannia Stadium, reports say Mourinho will communicate with his players from the team hotel via mobile phone. Mobile communication? That's the future. There are big games, then there are defining games. For Jose Mourinho, this is a big, defining game. 11 matches played in the Premier League this season, just three wins, leaving them 14 points behind leaders Manchester City. Spats, rants, fines and bans have been a regular occurrence this term.How much more can the owner take? Leaving the Britannia Stadium without three points is just not an option. Welcome to Stoke v Chelsea. Jon Walters, fresh from signing a new contract, leads the line for Stoke against Chelsea while there's also a start for Xherdan Shaqiri. Chelsea's forward line will be spearheaded once again by Diego Costa, with Pedro and Eden Hazard supplying the bullets.Cesc Fabregas, however, is on the bench. Get involved today, using #bbcfootball. It starts off with a scene called The Day of the Dead, followed by the theme song, Writing's on the Wall. Of course, I am talking about the new James Bond film Spectre - for those who haven't seen it - but that section could easily be called 'Jose Mourinho's 2015-16 season'. His behaviour this season hasn't been the best and defeat against Stoke could mean his time is up. Does owner Roman Abramovich have A View to a Kill? Or will Mourinho Die Another Day. One thing about his reign at Stamford Bridge is for sure, You Only Live Twice.